The Walk of Words: Merry Christmas! I've got visions of sugarplums dancing in my teacup... or, er, Sugar Plum Spice tea, one or the other. 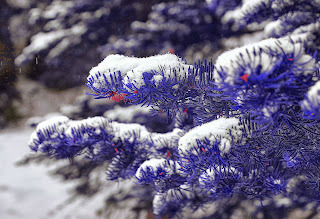 Three cats huddled under the snow-laden limbs of a blue fir tree. A tabby wrestled six purple pine branches, fallen courtesy of last night's ice storm, into a more-or-less circular shape. There, a wreath. Is it really Christmas? one asked, a small grey female. Who knows? another said. The tabby licked her paw and then stretched, claws digging into the cold earth. It's cold, and I want to celebrate. The yellow tomcat yowled in a passable g, a c, and another pair of c's, and kept going through a mostly-recognizable first stanza of "Oh Christmas Tree." On the next round, the little grey and the tabby joined in. Their yowls may not have been identifiable as notes, but they had never been trained musicians, unlike the tomcat, and really it was the thought that counted. At the end of it, the tabby purred. Wasn't that nice? I miss my son, the little grey said. He loves caroling. The tomcat licked her forehead. My kids. I miss them. They're adults, but they still liked to come home for Christmas. Like to? Liked to. When is my wife going to get here? I think she's late. She curled her tail around her paws. What were their names? The kids? He sneezed and shook his head. Names... Laying down, he batted at a branch of the 'wreath.' What was the question? The tabby began to groom her shoulder. And then the little grey decided her tail was in need of some straightening, and licked it a few times. After a moment, the tomcat looked up. Oh, it's you two. You know what? It looks almost like Christmas. We should sing some carols. Her ears twitching, the tabby stood up and stretched. That's a lovely idea. My grandson loves carols. Maybe he'll come by if we sing one and join us. Minutes later, a pair of deer plodded through the forest, trying to find the source of the horrible noise. The doe nudged her companion. Over there. What are they going on about? the stag asked. Who knows? They're cats. It's not like we can ask them. He shook a dusting of snow off his shoulders. It almost sounds like a song, a Christmas carol. Raising her head, she swished her tail in irritation. Why would they be singing Christmas carols? It can't be any earlier than March. It never snows like this in December, not around here. I miss Christmas, the stag said. Maybe they're on to something. At his nudge, the doe turned away. You go. I'm going somewhere quieter. Pawing at the snow, she flicked her ears back and forth. You never even told me your name. Something up ahead caught the light, a rock of some kind. It was sort of pretty. He inched over to investigate. Seeing her companion move, the doe followed, not willing to be left alone. A few feet later, the stag stopped, gazing at a trio of felines in a clearing to the left. What do you think they're doing? She looked up. Who knows? They're cats.